As college students gear up for peak stress season — finals — many are finding comfort in man's best friend, right on campus. A growing number of colleges across the country offer pet therapy, programs that bring registered therapy dogs to students need a break from the pressures of school. And because the programs are typically volunteer-based, they usually don't cost colleges any money. The health benefits of dogs (and cats, too) are well-documented. Petting a canine companion can help lower blood pressure and help ease depression. People with heart disease who own dogs tend to live longer than those with the same ailments who don’t own a dog. And pets help decrease stress by lowering levels of the stress hormone cortisol, and increasing levels of the neurochemical oxytocin, the love hormone. For all of those reasons, hospitals, nursing homes, and prisons have embraced pet therapy as a part of treatment and rehabilitation. They can also help college students, for example, cope with tragedy. 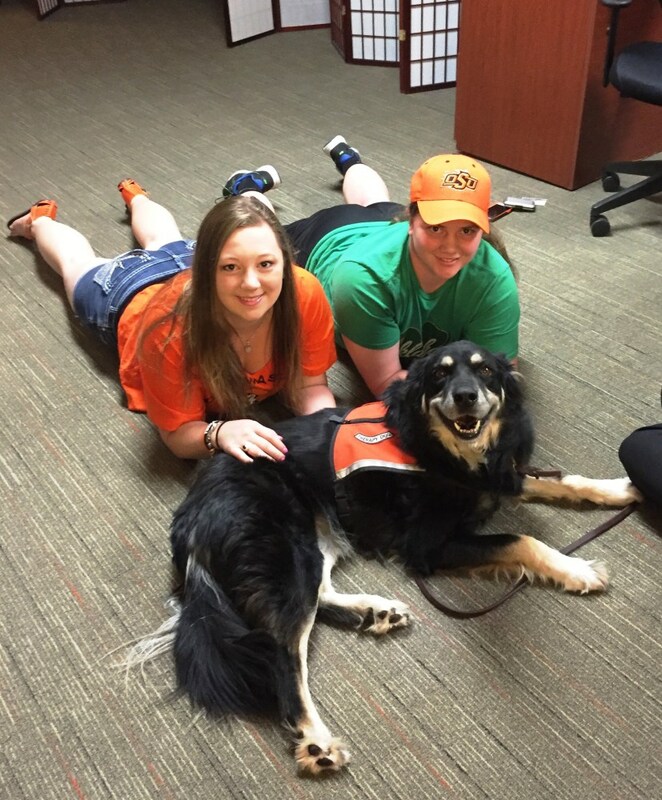 Just ask Amanda Slife, an Oklahoma State University animal science major grieving the loss of her mother, who died of colon cancer this past February. Slife grew up around animals, and though she has support of family and friends, she seeks out Charlie, a shepherd mix who is one of more than 20 therapy dogs available for students every day at Oklahoma State University in Stillwater through the on-campus pet therapy program Pete’s Pet Posse. “I love animals and I love all the dogs here on campus, but Charlie, for me, is special because he just loves to be loved on and to love,” said Slife, who visits Charlie every Thursday when he and the other dogs stop by Reboot, the university’s student stress reduction center. The center also offers presentations on stress management and technology such as heart-rate sensors that give real-time feedback on stress levels. 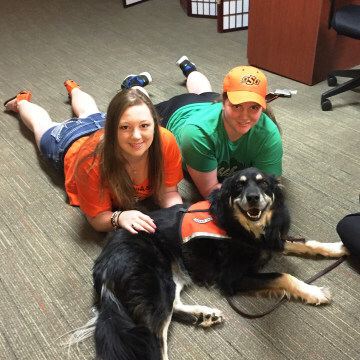 Like other school pet therapy programs, the dogs at OSU live with their owners and go through intense training to become registered as a pet therapy animal. Their owners go through training as well, and the therapy dogs carry liability insurance. They show up for duty in orange working vests imprinted with "Ask to pet me, I'm friendly." Many of them rescues, Pete’s Pet Posse dogs often come from difficult backgrounds themselves. 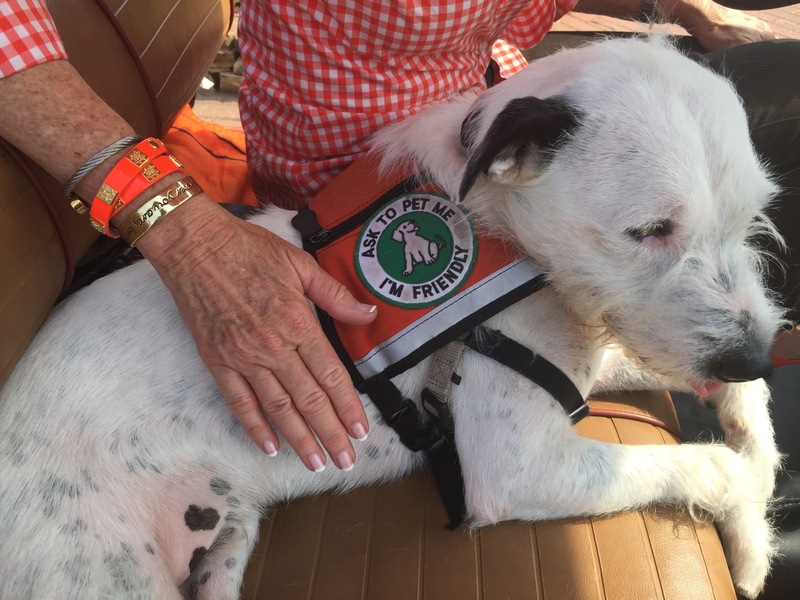 Charlie was found alone wandering near a lake before he was rescued and trained to be a registered pet therapy dog. 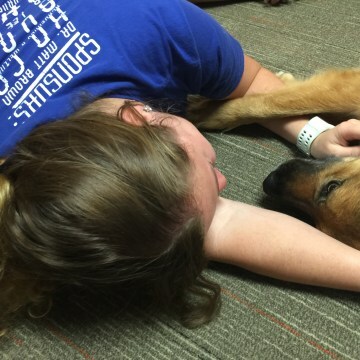 Evie, a black and tan shepherd who comes to campus with him, was found in the streets of Shawnee, Oklahoma, after a tornado. And Scruff, an abandoned terrier-mix, had been abused and shot. The dogs' empathy goes a long way. That was the case for Ashley Walters, an Oklahoma State fisheries and aquatic ecology major. 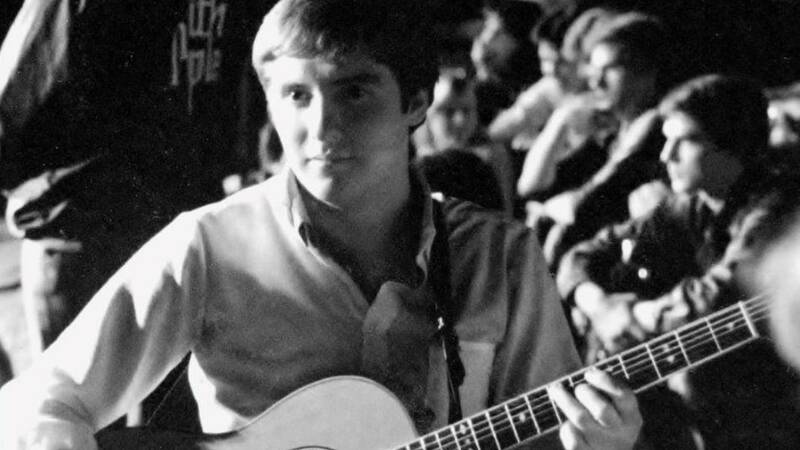 As a freshman, Walters was extremely shy and struggled to make friends. But during a campus event, she met Charlie, and fell in love. Since then she has not only met every therapy dog on campus, but has also made some great friends through a shared love of the animals. She's not the only one who feels that way, said veterinarian Dr. Lara Sypniewski, a founding member of Pete’s Pet Posse. “I love animals and I love people, too, and I know that these animals make every person happy. Plus it’s great for the dogs since they enjoy it, too,” Sypniewski said, adding 10 more dogs will soon graduate into the program. 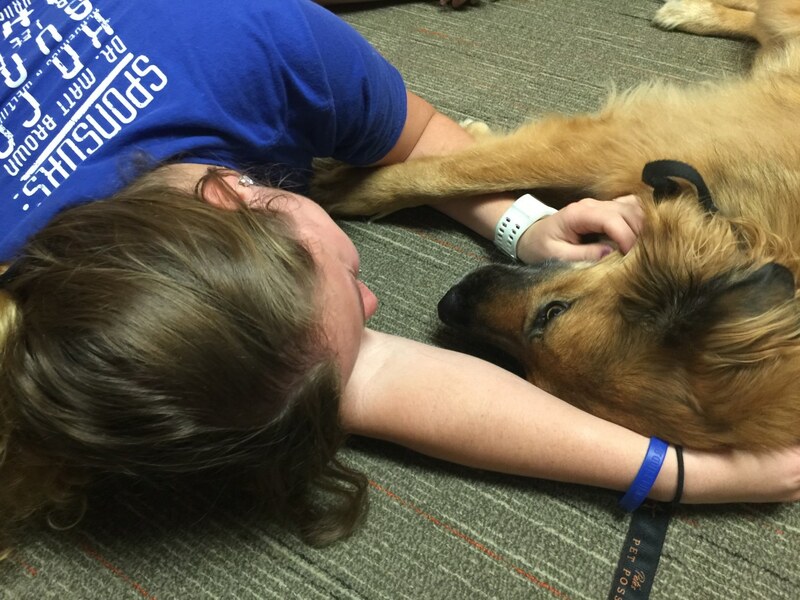 Not all campus pet therapy programs bring dogs to students on a daily basis. Kent State’s program, Dogs on Campus, has scheduled visits with students or are called on for special events and during high-stress times, such as finals week. Dogs on Campus was founded more than 10 years ago and has visited with some 77,000 students, according to founder Dr. Kathy Adamle, Kent State professor emerita. She got the idea for the program when she realized she couldn’t go more than 50 steps across campus while walking her two dogs without being stopped. 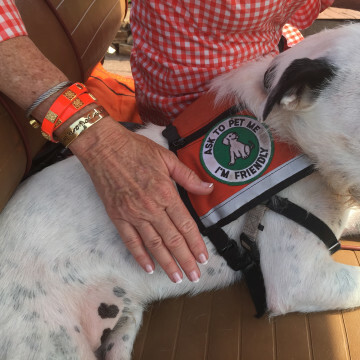 Oklahoma State is considering expanding its pet therapy program to someday include equine therapy and even a feline program, in which a cat could grace a counseling center, said Sypniewski of Pete’s Pet Posse.